Impressive off-road trip through one of the most unique regions of the globe, the Route of Emotions – Jeri, Delta, and Lençóis Maranhenses. 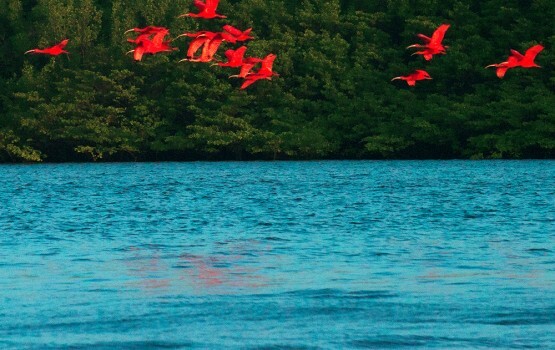 Fantastic landscapes such as “wilderness” of Brazil, full of crystal clear lakes, the only open sea delta in the Americas and one of the prettiest beaches in the world will be visited on this tour, which includes ecotourism, adventure, sun & beach, culture and cuisine. Three states of Northeastern Brazil will be visited in modern 4×4 vehicles and speedboats, besides several OPTIONAL activities such as walks, horse rides, panoramic flights, surf, kite and windsurf, bird watching and natural life besides living experience with local communities. Arrival in Parnaíba and transfer to the means of accommodation. In the afternoon we will do a Panoramic City Tour to the discover the main city attractions such as monuments Águia, Independência and Cashew tree Humberto de Campos, among others. After breakfast, transfer to the Porto of Tatus where embark on speedboat by the majestic maze of the Parnaíba Delta islands. We will do a quick photo stop in the dunes of the Big Island of Santa Izabel. We will explore the Igarapé of Periquitos, following his narrow channel flanked by various mangrove vegetation. In this stream will take place the search of crab, where the pilot-guide stick the bat in the mud of the swamp bringing the famous land crab (caranguejo-uçá), delicacy of the local cuisine. We will tour the Igarapé of Poldros, which divides the islands of Poldros and the Canary Islands. In this stream it is common to sighting animals such as monkeys, alligators, iguanas and several birds! 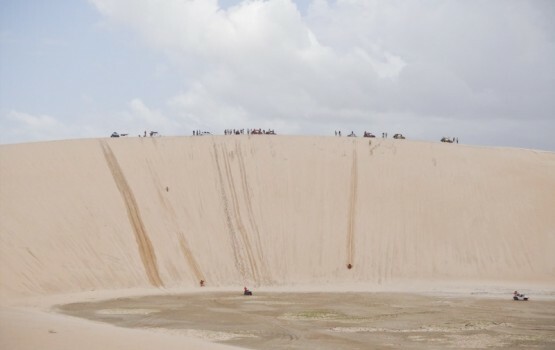 The landing on the string of Feijão Bravo dunes reveals a rare phenomenon in the world and in which the Delta is lavish. On the one side we see a river beach and the other a beautiful ocean beach, bathed by the majestic Atlantic! The mangrove forest and ponds (in full) complete the picture. Return to the port where we will go out in a private vehicle, will visit the Lagoa do Portinho, Piaui postcard where we will board the panoramic tour of the Atalaia, Coqueiro and Maramar beaches, and to the picturesque combed tree lasting 4: 00 approx. Overnight in Parnaíba. After the breakfast, and on board of a powerful 4×4, we will come out of Parnaíba towards Caburé Beach in the Lençóis Maranhenses. Departure of Caburé towards Barreirinhas in speedboat. After check in and lunch, on aboard of the 4×4 will cross the Rio Preguiças on the ferry, we will take the sand trails for about 40 minutes until the Lakes Azul and Feixes and its incredibly clear waters. A five minutes walk by dunes and we will reach the famous Blue Lagoon, an irresistible invitation for a swim. For those who want to explore the spectacular wilderness of Lençóis Maranhenses, the 20 minute walk to the beautiful Lake of Peixes is well worth. Before returning to the hostel, we will experience the setting of the sun in Lençóis Maranhenses, one of the most remarkable experiences that nature can provide. Overnight in Barreirinhas. After breakfast, and with all bags packed, departure to the port where we will embark on fast motor boats up the river Rio Preguiças. We will stop in Mandacaru lighthouse in the eponymous village, which on top of its eight floors reveal in 360 degrees all the exuberance of the place. We will continue by boat until Vassouras, one of the many points where the dunes of Small Lençóis Maranhenses find the Preguiças River. Monkeys and parrots make the party to the tourists who stop to cool off with cold drinks served in the shade of tents. We will continue by the Rio Preguiças until the Atins village where we will spend the night (optional: bib 4×4 ride to the Great Lençóis Maranhenses and Ponta do Atins). After breakfast, we will cross the river Preguiças by boat and will return to Parnaíba in 4×4 vehicle following to the Barra Grande beach lasting about 3h30m between beaches, dunes, fields and asphalt. Barra Grande beach has clear and calm waters, a paradise for kiteboarders from around the world, who come there in search of the trade winds that blow there without ceasing (optional Seahorse sighting ride). Overnight in Barra Grande. After breakfast, we will leave towards Jericoacoara by 130 km of asphalt to the ferry at the mouth of Rio Coreaú in Camocim, with which we will cross to the white dunes and the carnaubas (Brazil wax palm trees) until the Ilha do Amor (Love Island). The 4×4 will follow the seafront to the beach of Tatajuba. Panoramic Tour by Dune of Funil. In Lake of the Torta we will have fun with the little hammocks in the water and the curious “live” menu at Didi restaurant. 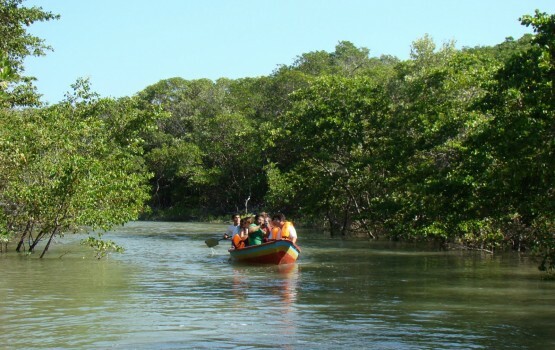 The second crossing in ferry occur in Guriú Beach, with the green waters of the channel and mangrove trees Cemetery. We will continue to Jericoacoara by the seaside in time to enjoy the setting sun on the famous dune of the same name, daily ritual of residents and visitors of the place. The overnight stay in Jericoacoara will give us the chance to appreciate the nightlife of the town, its restaurants, shops and bars. 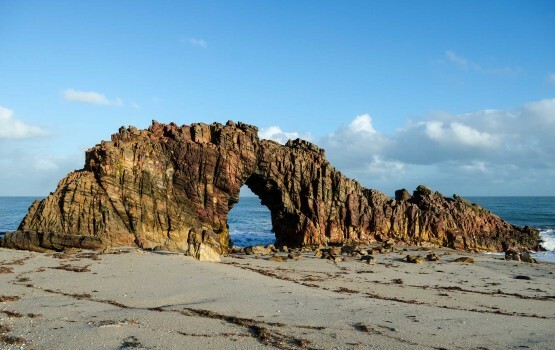 After breakfast, off-road tour at Lagoa do Paraíso and Lagoa do Coração lagoons, visiting the Pedra Furada (Holed Stone), another of Ceará’s postcard , which we will reach after a 15 minute walk from the Duna do Serrote. 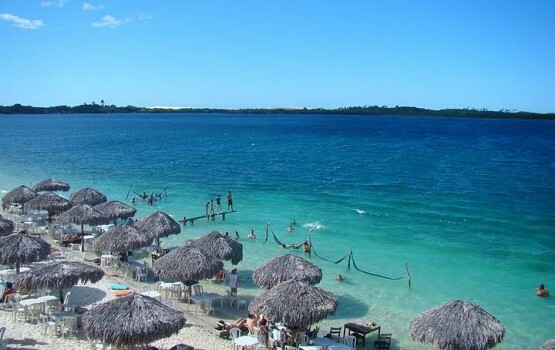 On the Lagoa do Paraíso, the vibrant colors of the place refers to the Caribbean paradise: white and very fine sands are confused with the green of the ground vegetation and coconut trees which in turn frame the turquoise crystal clear water. Overnight in Jericoacoara. After breakfast, we will go back to Parnaíba where we will board towards the city of origin. End of services. There are three categories of accommodation for this Itinerary:: Light, Comfort and Stars. Ask Rates! Light: Comfort and economy hotels specially selected. Comfort: The best value for money. Comfortable and tourist hotels and inns that keep a certain functional charm. Stars: For more demanding, brings together senior apartments in the best hotels in each destination. All accommodation with breakfast in the chosen category: 3 nights in Barra Grande and 4 nights in Jericoacoara. Between destinations: Transfers Parnaíba/Barra Grande (private), Barra Grande/Jericoacoara(private), Jericoacoara/Parnaíba (private). Parnaíba: Ride in speedboat to the Delta do Parnaíba with flight of Guarás (ibis) (privativo). Panoramic ride to the Lagoa do Portinho and Atalaia, Coqueiro, Maramar beaches as well as the combed tree (private). Jericoacoara: Off-road rides by lagoons Paraíso, Coração and Pedra Furada (private), Lagoa de Tatajuba (Lagoa da Torta) and Dune of Funil (private).Between destinations: Transfers Parnaíba/Barra Grande (private), Barra Grande/Jericoacoara(private), Jericoacoara/Parnaíba (private). Jericoacoara: Off-road rides by lagoons Paraíso, Coração and Pedra Furada (private), Lagoa de Tatajuba (Lagoa da Torta) and Dune of Funil (private).